I’m pretty excited today, actually just got excited about 10 seconds ago, when I saw that I’ve written over 300 blog posts here at Social Media SEO. The exact number, with this post included, is 316. I see the dashboard of this blog all day long, but for some reason, right now, the blog post number stuck out to me. And I was like “wow – 315 blog postings!”. Social Media SEO is not even 2 months old yet. 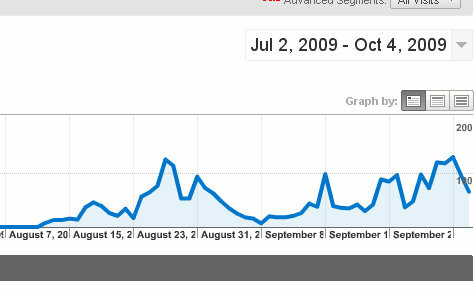 I just looked at my analytics and saw the first traffic data hit on August 12th with a mere 8 visitors all day long! Which I was excited about, let me tell ya’ – that’s great news for a blog that just hit the web. So I wanted to quickly thank those of you who are here and reading Social Media SEO. My goal with this blog is to provide valuable content that educates people – whether through news tips, or “how to’s” – I want to provide a site that delivers valuable information to you, the reader. Thank you all so much for being here with me at Social Media SEO!